Do you have a favorite book? I've been asked this question many times and I always respond that is is akin to asking me if I have a favorite kid - there's no way I can choose, but certain ones are definitely more appealing at different times! Let's be honest. When one kid is quietly reading a book while the other two are waging a booger war by the patio door you just cleaned, it's pretty clear which kid is the favorite in that moment. I would argue that the same concept can be applied to books of the Bible. Not the booger war part, because I'm pretty sure the armies of Israel would have been stomped out pretty quickly. I'm thinking of how different books of the Bible can really jump off the page in new ways and become our favorites in different seasons of life. The Spirit is really quite amazing this way, wouldn't you agree? Am I the only one out there who has jumped into a particular study or opened up to a certain book of the Bible at a seemingly random time only to find that the Word we find there is exactly what our soul needed to hear at that moment? This is why I want to make time in the Word a priority in 2015. It is a living, breathing, dynamic conduit of God's truth that provides a lifeline to us. 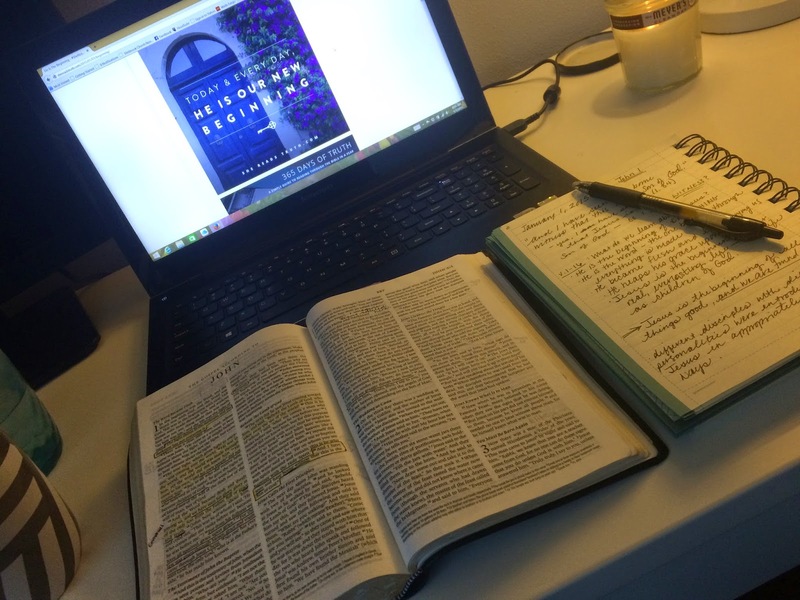 As I mentioned previously, I am starting off this year studying the book of John along with She Reads Truth. We launched on New Year's Day with the first chapter, a familiar chapter that I've read many times before. That's why it was so exciting with something special jumped off the page at me and brought exactly the word I needed at the beginning of this new year. It popped off the page all over the place, this partnership of "seen" and "bear witness." They went together like peanut butter & jelly. This section of the chapter really got me excited. The partnership of sight and witness is repeated, but that last verse is incredible and challenging. And I have seen and have borne witness that this is the Son of God. Friends, I have seen that this is the Son of God. I have experienced his grace and know his truth. I have acknowledged Jesus by faith to be the true Son of God, the atoning sacrifice for my sin and my only hope for a life of freedom from sin and an eternity in the presence of the Father. I know this to be true. I have SEEN. But do I bear witness? Like I said, these two things are tightly linked in this chapter. Seeing and experiencing Jesus Christ should be immediately partnered with witnessing about him. If I really wanted to, I could lock myself in my little Christian bubble and never really have to bear witness to anyone who wouldn't already understand. There would be a lot of "Amens" and "that's such a God thing!" but would there be the potential to introduce someone to the Son of God for the very first time? Perhaps not. But here, in John 1, that's what John the Baptist is doing! He's basically set up shop by the river to bear witness about seeing Jesus - telling everyone he could! Lately there have been several times where non-believers at my night job have asked me seemingly random questions about my faith out of the blue. Heck, on New Year's Eve I walked up to one of the computers to ring in an order only to be met with the loud inquiry, "Sarah! Do you believe in speaking in tongues? Is that a real thing?" I completely forgot what my table needed, but I did engage in a conversation about this question and shared what I know from Scripture about this gift of the Spirit. Other issues have come up in the past at this job - the authenticity of the Bible, tithing, the second coming of Christ, among others. Every time a door opens for me to talk honestly about the truth of Jesus, I am both excited and intimidated. The stakes are so high - what if I get it wrong? What if I don't know enough about the Bible to be able to quote something correctly? What if I don't have enough evidence to back up a claim I am making? But when I look here in John, the man baptizing in the Jordon didn't worry about all that. He saw Jesus, recognized him and the Son of God, and bore witness. He told about what he had seen, what he had experienced, and then directed people to Jesus so that they too could see, experience, and then bear witness themselves. 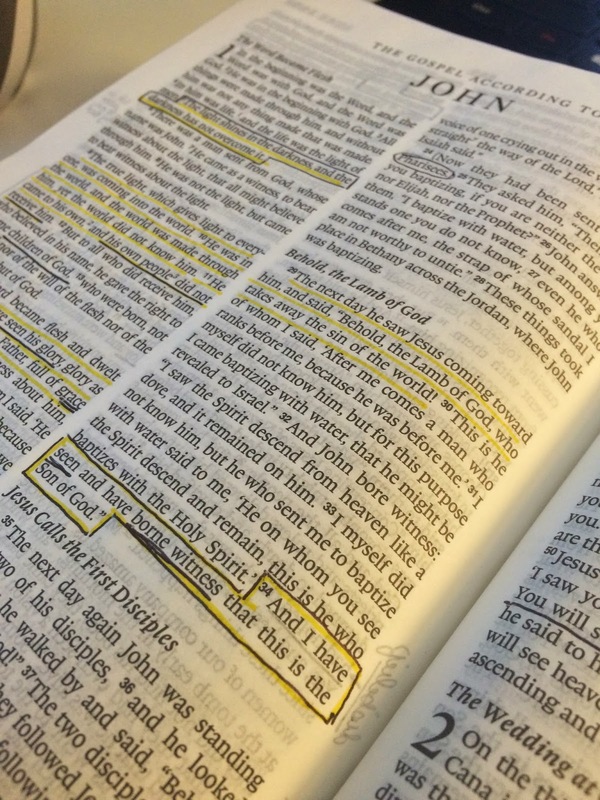 Why should I think that God would ask more of me than he did of John? Bear witness to what you have seen. Let me do the rest. And when you miss the mark, my grace upon grace will be there to catch you. I'd love to have you join in on the John study or maybe the #365DaysofTruth with me over at She Reads Truth. There were so many ladies trying to get started right away on the morning of January 1st that the site and app crashed! (Yup, that is indeed spiritual warfare in the technology age!) So if it doesn't work right away, just try again later. I promise you won't regret it.